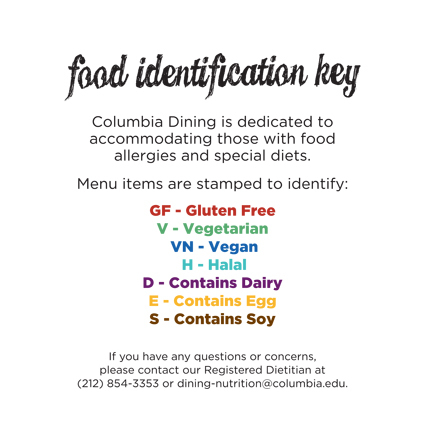 Food served in John Jay Dining Hall and Ferris Booth Commons are labeled using the identification system show below. Gluten-free items are labeled with a red GF, items containing eggs are labeled with a yellow E, and items containing dairy are labeled with a purple D. If you would like to know more about the ingredients in a food item, please ask a manager for immediate assistance, or contact our Registered Dietitian via email. Separate refrigerators are located in John Jay Dining Hall and Ferris Booth Commons solely for gluten-free items, including gluten-free bread, bagels, crackers, cookies, etc... Gluten-free toasters are also available in those areas. Gluten-free pasta, pizza crust, and hamburger buns are available upon request. Please ask a manager for assistance with gluten-free items. We recognize that eggs and dairy are common food allergens, as well as identifiers as to why a certain item may be vegetarian and not vegan. As shown above, items containing eggs are labeled with a yellow E, and items containing dairy are labeled with a purple D. If possible, these items are omitted from recipes so as to accommodate such food allergies and vegetarian/vegan diets. We recognize that this is one of the most common food allergens. However, nuts are also a healthy source of fat and protein for vegan and vegetarian diners. Each dining hall has created a special "nut zone" for peanut butter, raw nuts, and products containing nuts. A special set of utensils and dishes are used at those stations. Any items containing soy are clearly marked.